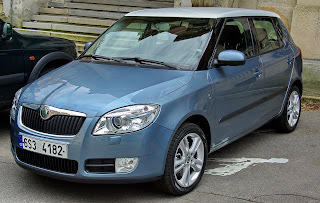 We rented a small car for our trip to Vienna and we were given a Skoda Fabia 1.2 HTP, which stands for High Torque Performance. For a 1.2 l car it's a gutsy little thing with bags of room. Build quality is far ahead o f what we're used to and this is a car that competes with a comparable Kia. We are so shafted when it comes to cars in Malaysia. Here's a pic of the car. I pulled this off the internet. The actual car was silver. Here's the ad. Trust me. It's superbly entertaining and very relevant to us. haha yeah i saw this ad before. it's amazing! You intrepid fella! You drove? I'd be too busy drooling over hot Europeans to look at the road signs. LL; yes it's a great ad and a great all round car. Not exciting but does everything well and very well built. Doc; got lah. Ogle and then look at road lor.